Bonita Bay Amenities | Bonita Springs, Estero, Naples, Fort Myers Beach FL Real Estate | Marie Pimm PA Realtor. Representing U.S. and International Buyers and Sellers in the purchase and sale of investment or personal property. Marie is a skilled 1031 Exchange Realtor. The Bonita Bay master planned, gated community is celebrated for its environmental stewardship, award-winning landscaping, and creative land use, including three waterfront parks, 1,400 acres of open space including lakes, nature preserves, and a 12-mile network of biking and walking paths. Bonita Bay Marina provides direct access to the Gulf of Mexico. The private beach is the perfect place to end your day with a spectacular gulf coast sunset. Member-owned since 2010, the Bonita Bay Club is a renowned country club in Bonita Springs and Naples. Membership is required for use of the golf, tennis, swim, fitness and dining facilities of Bonita Bay Club. There are three different equity membership options for Bonita Bay Club: resident golf membership; resident tennis membership; and resident social membership. Bonita Bay’s private Beach Club offers residents the perfect place to relax and enjoy sun, sand and azure waters of the Gulf of Mexico. Picnic pavilions with grills for cookouts andshowers and restrooms are available. The Beach Club is a 10-minute drive from Bonita Bay and is accessible by the community shuttle bus during the season. Enjoy boating on the waters of the Estero Bay and the Gulf of Mexico from Bonita Bay’s own full-service marina conveniently located on the Imperial River.The full-service marina offers boaters a fully stocked ship’s store, wet and dry slips as well as charter fishing, sightseeing cruises and bait and fuel. Bonita Bay’s private resident-member restaurant overlooking the marina basin is open daily for lunch, dinner, snacks and cocktails. Menu specialities include seafood dishes, salads, sandwiches and much more. Located at the north end of Bonita Bay, Spring Creek offers a great way to appreciate nature’s many treasures. Enjoy canoeing on the pristine Spring Creek waters from this unique facility complete with canoe racks and launch, nature trails, observation deck, children’s playground and picnic site with grills. This naturally landscaped park offers a variety of recreational activities, including two lighted tennis courts, a 12-station Parcourse fitness trail, boat ramp and day slips in the park¥s basin, children’s playground, picnic areas, basketball court and fishing. Located along Estero Bay in the Eagle Watch section, this park offers residents an historical, archeological and environmental perspective on many of the natural benefits of the area. A series of trails lead visitors past information stations identifying plants and animals, historic sites and archeological remnants. The park also includes an 800-foot boardwalk leading to Estero Bay, a screened pavilion, children’s playground, butterfly garden and picnic sites. Bonita Bay Club’s Tennis and Swim Center provides members with 18 Har-Tru courts and a full schedule of exhibitions, tournaments and private lessons. There’s also a tropical pool and sundecks where members can enjoy laps or just lounging. The newly expanded Fitness Center offers members a variety of equipment and programs to maintain a healthy and dynamic lifestyle. Classically designed, 45,000 square foot main clubhouse with formal dining room, casual Club Room dining, banquet rooms, extensive pro shops and locker rooms. Marsh Course redesigned 1993, weaves its way through the breathtaking wetland terrain of Southwest Florida, playing from 4,923 to 6,636 yards on four sets of tees. Audubon certified. Creekside Course, 1990, – broad sweeping fairways and limited number of carries present on this masterpiece belie the true challenge its 6742 yards represents.Golfers must navigate the many hills and moguls leading to the course¥s challenging greens. Audubon certified. Bay Island Course, 1994. 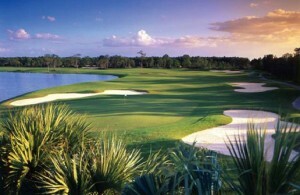 Ranked among the best course in Florida by Golf Digest, this competitive 7,045 yardcourse draws from the natural lay of the land to create a unique combination of challenges.Water hazards, sand traps and thick stands of oak and cypress await any errant shot. Audubon certified. The East Clubhouse, an 8,294 square foot facility features a formal dining room, a mixed grille room, full service bar and pro shop and locker areas. Cypress Course, 1997. 18 Holes, playing to an impressive 7,077 yards, the par-72 Audubon International Signature Course is the longest of Bonita Bay’s championship courses. Each of the “nines” on this majestic course present a different challenge, as the front nine’s more spacious fairways and natural bunkering give way to the heavily forested back nine’s layout. Sabal Course, 1998 Designated a Signature Course by Audubon International, the 18 Hole Sabal Course represents a perfect marriage of difficulty and diversion.Tom Fazio’s 7,038 yard design allows a level of playability that will delight novice golfers, while more seasoned players are challenged to swing for the pin, and sub-par scores, on nearly every hole.